This is a two-part article on American football positions. The first half of this article focuses on offensive football positions, while Page 2 discusses defensive football positions. In college football and the NFL, opposing teams will employ a variety of positions in order to win the game. Some positions, like the quarterback, will be on the field for large stretches of time, while others, like the punter, will only appear at select moments throughout the game. All this activity can make it difficult to keep up with who�s doing what, so that�s why I put together this handy guide on the various positions you might find in a NFL or college football game. The most high-profile position in football, quarterbacks tend to make more money and be selected higher in the NFL Draft than other players. This is not undeserved, however, as a quarterback can literally make or break a football team. 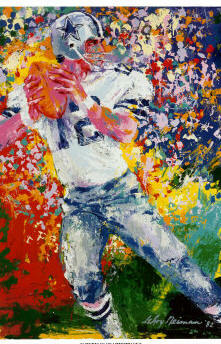 Famous modern quarterbacks include Brett Favre, Tom Brady, Peyton Manning and Tony Romo. The leader of the offense, the quarterback lines up behind the center to receive the ball. When the ball is snapped, the quarterback may run, attempt a forward pass or hand the ball off to another player. Since he touches the football on almost every offensive play, the quarterback is considered to be a team�s most important player. In many cases, the quarterback will also call the offensive plays (at the very least, he can change the play at the line of scrimmage by called an audible). Other positions may be substituted in and out of the game based on various situations, but the starting quarterback will almost always be in the game while his team is on offense. When the outcome of a game has largely been decided, the quarterback may be replaced with his backup to avoid unnecessary injuries. College football quarterbacks with exceptional speed and quickness may be utilized in an option offense. In this style of offense, the quarterback will often scramble towards the end of the offensive line, while the running back trails behind him. As he does so, the quarterback will see how the defense reacts. He then has the �option� to take a number of different actions. He may throw the ball downfield, continue to run with the ball or toss it back to the running back. Whether it�s in high school, college or the NFL, jersey numbers for a quarterback tend to fall between one and 19. In the NFL, a quarterback�s jersey must be within this range. Also known as a tailback or simply a running back, the halfback position is responsible for lining up in the backfield (behind the quarterback) and carrying the ball during running plays. The halfback may also be utilized as a receiver out of the backfield, and on rare occasions, they might actually line up as a wide receiver. Famous modern halfbacks include LaDainian Tomlinson, Brian Westbrook, Emmitt Smith and Adrian Peterson. When not running with or catching the ball, the halfback will be called upon to help block for the quarterback. This is an important assignment, as halfbacks who miss a key block can leave their quarterback vulnerable to big hits and possible injury. In most cases, the halfback will attempt to halt the progress of safeties or linebackers. The halfback is often dependent on his offensive line to create lanes (or �holes�) to run through. While a skilled running back can often create his own opportunities, a proficient offensive line can make his job much easier and lead to increased production. While serving as a possible pass catcher, the halfback will often run a shorter route than the wide receivers. This allows the quarterback to dump the ball of to the halfback if all his other options are covered. In the case of the West Coast Offense, the halfback may be the primary receiver on a passing play. Some teams have a halfback designated as a �goal line back,� �short yardage back� or �third down back.� These players often specialize in either getting a few tough yards or stretching the defense with their receiving abilities and speed. Halfbacks may also be called upon to return punts or kickoffs. While this duty is often reserved for defensive backs and wide receivers, many halfbacks have also been successful. In fact, the NFL�s all-time leader in punt and kickoff return yardage is halfback Brian Mitchell. The average size for a halfback ranges from 180 to 240 pounds. Power backs often weigh 230 lbs. or more, while halfbacks closer to 200 lbs. tend to be faster. The average ball carrier will be in the 215 to 230 lb. range. Located in the offensive backfield, the fullback may either run with the football or serve as a blocker for the halfback or quarterback. 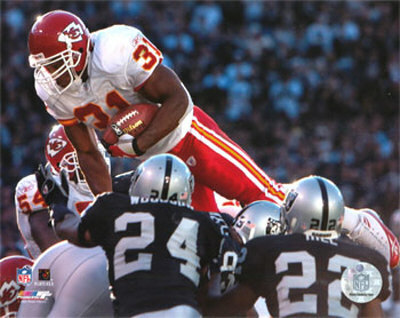 Famous modern fullbacks include Mike Alstott, Lorenzo Neal and Tony Richardson. The modern player at the fullback position tends to be larger than a halfback, and they often specialize in breaking tackles, getting tough yardage and pass catching. In previous decades, however, many of the star players in the NFL were fullbacks. This included men such as Jim Brown, Larry Csonka and Bronko Nagurski. Players who line up on the ends of the offensive line are eligible to catch passes. Since receivers are located closest to the sidelines, they are referred to as �wide� receivers or wideouts. Famous modern receivers include Terrell Owens, Randy Moss, Jerry Rice and Marvin Harrison. While they may be called upon to provide downfield blocking during running plays, the primary responsibility of a wide receiver is to catch passes from the quarterback. In most cases, the receiver will be covered by either a safety or a cornerback. In the case of an elite receiver, both a safety and cornerback may be assigned to the player in an effort to reduce production. Receivers with great speed are often known as �deep threats,� as they can stretch the field and pick up huge chunks of yardage on a single play. �Possession receivers,� are sure-handed players who often pick up tough yardage by working the middle of the field. In some cases, a receiver may also be called upon to run the ball. This will most likely take place during a �reverse� play. While these plays can be highly effective, they can also place the wide receiver at a greater risk for injury. Split End (also known as the �X� receiver) – NFL rules require seven players on the line of scrimmage at the snap, so this is where the Split End can be found (on the side opposite of the tight end). Flanker (also known as the �Z� receiver) – The Flanker lines up slightly behind the line of scrimmage, often using this buffer zone to avoid contact with defenders (since contact with receivers within 5 yards of the line of scrimmage is allowed). The Flanker will most often be found on the same side as the tight end. On many team, the Flanker will be the team�s primary receiver. Slot Receiver (also known as the �Y� receiver) – These receivers can be found lined up between the wide receivers and the linemen. If they are lined up on the side of a Flanker, then they will most likely be lined up slightly off the line of scrimmage. If on the same side as a Split End, the Slot Receiver will be lined up on the line of scrimmage. Slot Back – This term applies to a receiver lined up in the offensive backfield. In American football, this position is used most effectively in a flexbone or Triple Option offense, which is most likely to be found in the college ranks. In the Arena League and the Canadian Football League, Slot Backs are allowed to get a running start towards the line. A Slot Back is rarely found in the NFL. Located at the end of the offensive line, the tight end is most often used for blocking or pass catching. The side on which a tight end is located is known as the �strong side,� while the other side of the field is known as the �weak side.� Modern tight ends include Antonio Gates, Tony Gonzalez, Jason Witten and Chris Cooley. In many cases, the tight end may be left uncovered by the defense, and the offense will try to take advantage of this. One popular play is for the tight end to look as though he�s blocking in pass protection for the quarterback. Then, the tight end slips a few yards up the field and catches a short pass. In the modern NFL, many tight ends specialize in either blocking or pass catching. While most can perform both duties, players like Antonio Gates seem especially talented at catching and running with the football. Blocking tight ends, on the other hand, may weigh in the 300 lb. range. They will work with the fullback to either open up holes in the defensive line or provide pass protection for the quarterback. High school and college football programs allow jerseys numbered 1-49 and 80-99 for the tight end position. 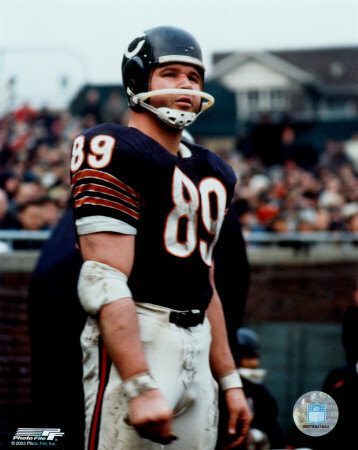 In the NFL, tight ends must wear 80-89, or 20-49 if those numbers aren�t available. The hybrid of a fullback and tight end, the H-Back was popularized by Coach Joe Gibbs of the Washington Redskins in an effort to counter Giants linebacker Lawrence Taylor. The H-Back may be called upon to run routes, block or aid in pass protection. They can get set on the line, in the backfield, or they may be sent into motion. Not every NFL team utilizes the H-Back position. 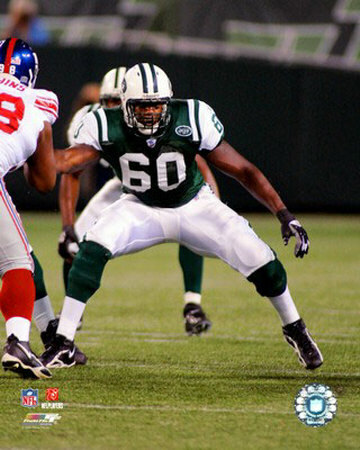 Part of the offensive line, the offensive tackle�s job is to protect the ball carrier from the defense. This can take of form of pass protection for the quarterback or opening holes for the halfback. Offensive tackles will usually block against defensive ends. Right Tackle – Often the best run blocker on the team, the right tackle is usually lined up next to the tight end on the �strong side� of the offensive line. His job is to open holes for the runner and take on the defense�s best run stoppers. Left Tackle – Since most quarterbacks are right-handed, they will often turn their backs to the left side of the field when throwing a pass. This makes left tackles especially important, as they block defensive ends and prevent their quarterback from getting blindsided. In recent years, left tackles have become some of the highest-paid players in the league. Notable left tackles include Jonathan Ogden, Orlando Pace and Chris Samuels. Guards are located between the center and tackle positions on the offensive line. Like offensive tackles, their job is to open holes for the halfback and protect the quarterback from being sacked. An offensive line has two guards on the line of scrimmage, a left guard and a right guard. Notable offensive guards are Leonard Davis, Alan Faneca and Logan Mankins. Since the center has the best view of the defensive line and linebackers, he is responsible for making calls to adjust the offensive line. Once the ball has been snapped, the center will engage in either run or pass blocking. In the shotgun formation, the quarterback is lined up several yards behind the center. 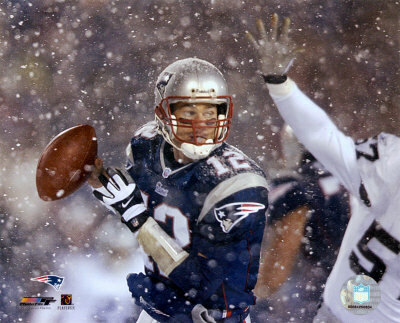 It then becomes his job to safely snap the ball into the quarterback�s hands.